The first mammals appeared in the Late Triassic, but the first fossils are incomplete. 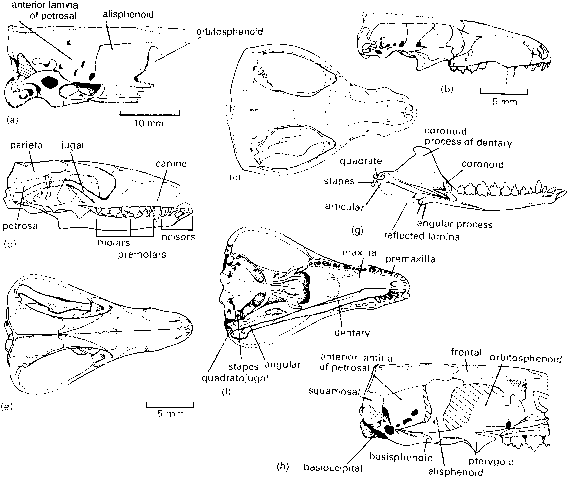 Adelobasileus and Sinocon-odon appear to be the most basal mammals,but the first reasonably well-represented mammals are the mor-ganucodontids from the Early Jurassic (Kermack et al., 1973,1981; Jenkins and Parrington, 1976). These early mammals were tiny, with 20-30-mm skulls and total body lengths of less than 150 mm. They probably looked generally like shrews. however, to show that it is very probably a mammal. The braincase shows a number of features characteristic of early mammals. The reptilian epipterygoid, typically a thin column of bone, has become a broad sheet, termed the alisphenoid in mammals. 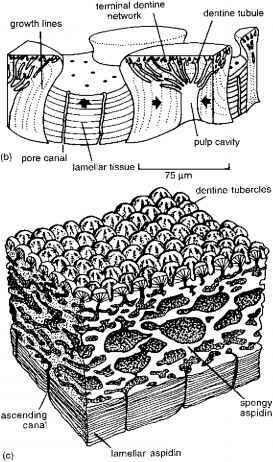 In front of this, a new element, the orbitosphenoid, contacts the frontal and palatine in front and forms a solid internal wall in the back portion of the eye socket. Towards the rear, the brain is expanded and it is enclosed almost completely in bone. Basal amniotes have the brain enclosed at the side only by the prootic, opisthotic and epipterygoid bones (see p. 108). In Adelobasileus, the prootic sends a large sheet of bone forwards, the anterior lamina of the periotic (or petrosal), which meets the parietal above and alisphenoid in front. The trigeminal nerve, cranial nerve number V, sends two major branches to the snout, temporal and lower jaw regions through the anterior lamina of the petrosal. There are numerous other mammalian characters in this remarkable early specimen (see Box 10.3).